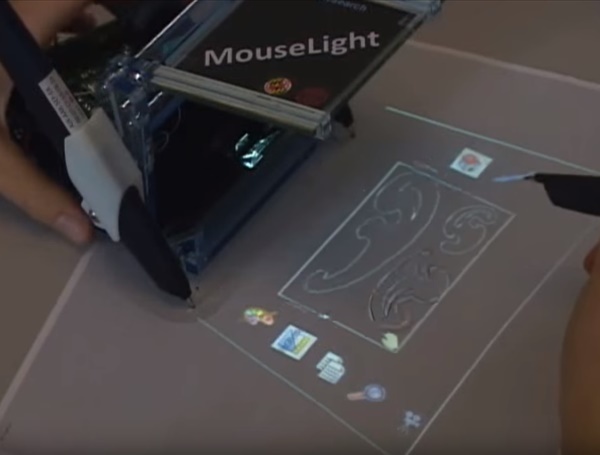 MouseLight is a standalone mobile projector with the form factor of a mouse that can be used in combination with digital pens on paper. Using this unique combination of hardware components, users can interact with virtual layers of information which augmented physically printed content on paper, supporting a seamless transition between virtual and physical information. In addition to presenting a high fidelity hardware prototype, we develop a set of novel interactions specifically tailored to the unique properties of MouseLight, which differentiate it from related systems such as PenLight. This includes a rich set of bimanual interactions inspired by the ToolGlass interaction metaphor, but applied to physical paper. In addition, our system demonstrates novel displaced interactions, where the user can interact outside of the projection region, using the paper as a physical proxy for virtual interactions. We also report on a preliminary evaluation of the system, which produced encouraging observations and feedback.